East Aswan inhabitants have accidentally stumbled upon what is believed to be a set of rock-hewn tombs on Elephantine Island, which displays a wide range of monuments from the prehistoric period to the Greco-Roman era. 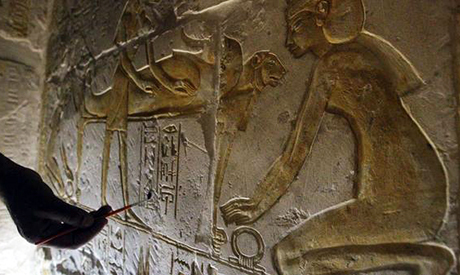 Minister of Antiquities Mohamed Ibrahim told Ahram Online on Monday that early studies on the tombs' wall paintings reveal that they are dated to the New Kingdom era, which makes a very important discovery that may change the history of Elephantine Island. Ali El-Asfar, head of the Ancient Egyptian Antiquities section, explains that the first tomb belongs to a top official in Elephantine named User who was a prince of Elephantine during the New Kingdom. User’s tomb is well decorated with scenes depicting him in different positions with his family and deities. Among the distinguished wall paintings is a scene featuring the deceased wearing leopard fur along with five priests before an offering table, El-Asfar said. 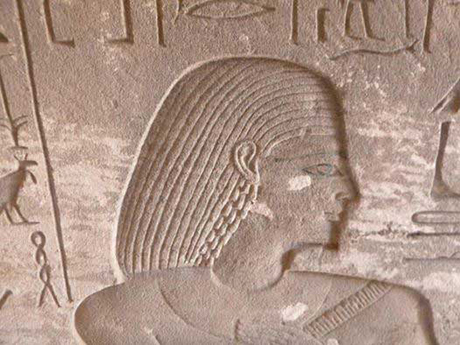 Head of Aswan monuments Nasr Salama said that the second tomb belongs to Ba-Nefer, supervisor of the gods' priests of Elephantine. 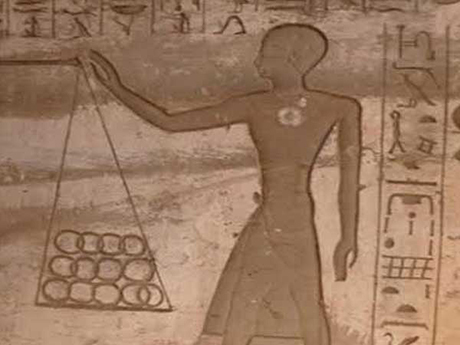 His tomb is also engraved with scenes depicting him in different positions with his family and deities. The third tomb belongs to the holder of the stamps of upper Egypt and Elephantine ruler Amenhotep, while the fourth one belongs to Elephantine ruler User Wadjat. 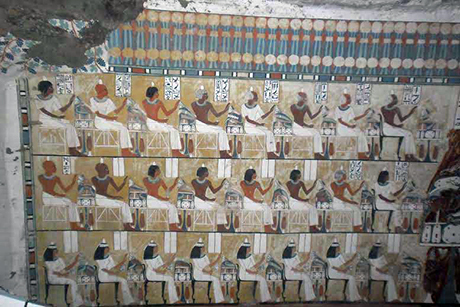 Salama told Ahram Online that the tomb of Amenhotep has a distinguished façade decorated with hieroglyphic texts without any scenes. Its inner walls are decorated with scenes depicting the deceased with his wife, the purification priest and the field scribe. Ibrahim said that these tombs are under restoration in order to open them to tourists. Very interesting, and with photos! Prince User is named after the very ancient resurrection god, Osiris/Wassir/User. Regarding his wearing a Leopard skin in scene, Buddha is also depicted with followers that wore very similar animal skins. India and Egypt have very ancient ties. Regarding the User Wadjet ruler, I'd like to point out the similarity between "Wadjet" and a typical Buddhist temple "Wat Ched(i), silent "i", and that some images of Amen/Amun are depicted with 8 serpents arrayed around his head to guard, very similar to images of Buddha with 9 serpents arrayed similarly. Not to mention: "Ka" and "Ba" both mean very closely the same in ancient Egyptian and Thai languages. Those "Intermediate Dynasty" pharaohs named "Sewadjkare"...sure sounds like "Sawasdee Ka, Re" to my ear. ...must be finished soon, so we can show off these tombs to the rest of the world, Egypt is a beautiful country, let the rich tourists pour their money there! So you are saying just because the people that live in Eygpt now are not related to the tombs they are digging up is reason NOT to have respect. THats not saying much for the present day Egyptians then, is it? Ancient Egypt never ceases to amaze me. A truly wonderful land. I just find it a shame that (a lot) of nowadays Egyptians do not show any respect for this past and only see it a a "money-making-machine". Kind regards, Jean Houwert P.S. What ever happened to Zahi "Indiana Jones" Hawass? the reason the "egyptians do not show any respect for their past" is due to the fact that it isn't their past. the people who inhabit egypt today are not the of the race of people who are known as the" ancient egyptians" they are transplants.